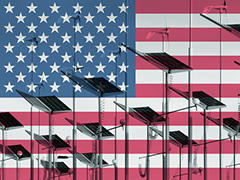 As new energy technologies emerge in the global marketplace, does it ever feel like we in the U.S. are falling behind? We still rely largely on fossil fuel energy plants, even though we have better resources at our fingertips. According to a new paper, the answer to why that is lies in the regulation. More than 150 energy experts came together to write and review “America’s Power Plan,” which is a toolkit for legislators to make new policy that will help the country transition to a cleaner and safer energy future. “I think utilities need to be given a little more flexibility to try new products or new programs in order to take advantage of changes in the marketplace, be it charging electric vehicles, distributed generation or the like. Smarter regulation and market design – along the lines of the recommendations in ‘America’s Power Plan’ – can facilitate this,” states Jonathan Weisgall, V.P. of MidAmerican Energy, on the paper’s website. Alternative energies are becoming more and more viable, and people want them. According to the paper, solar energy costs have decreased by 80 percent and wind energy costs by 30 percent in the last five years. Consumers and businesses want these better energy sources. They want energy that is cleaner, more efficient and, of course, affordable. The biggest obstacle to achieving these things is outdated regulation meant for a fossil-fuel dominant energy market. “America’s Power Plan” likens the introduction of new energies to the current legal, financial and regulatory structures to that of the introduction of the iPhone into the era of the rotary phone. But this paper attempts to make that transition possible by providing expert guidance for decision makers on utility business models, finance, market design, transmission and distribution policies, distributed energy resource integration and siting. The paper is realistic. It doesn’t offer a one-size-fits-all solution, but acknowledges that change will happen on a regional basis. “America’s Power Plan” can be passed on, another forgotten page on the information super highway. Or, it can act like a blueprint for our energy future. Let’s hope that some of the impressive credentials attached to it can help make it the latter. Posted on October 1st under Renewable Electricity.